Facing defeat, the Nazis marched 6,000 Jews. A survivor’s account. 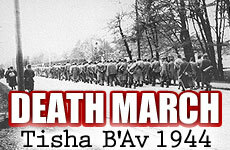 Between 1939 and 1945 hundreds of thousands of Jews perished in death marches. This was especially true in the last year of the war as the Third Reich crumbled. Even when it was clear that Hitler’s Germany was doomed, the Nazis continued to march hapless Jewish prisoners aimlessly and mercilessly from one place to another. This is the story of one of those “death marches” as related by Mr. Reuven. This entry was posted in History, Holocaust, Tisha B'Av. 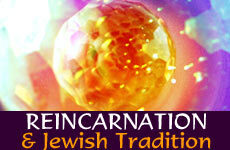 Does Judaism espouse belief in reincarnation? The word eschatology is defined in the dictionary as a branch of theology concerned with the final events of the history of the world. The truth is that eschatology is not exclusively the domain of religion. The most striking example of a secular eschatology would be Marxism: the convulsions and agonies of the class war, its evils resolving themselves into the classless society, the withering of the state and the blissful existence ever after. This entry was posted in Afterlife, Soul Searching and tagged Afterlife, Judaism, Reincarnation, Soul, Soul Searching. When you think about it, we are incredibly small. The Earth is nothing but a speck of dust in the sea of an ostensibly infinite Universe. In fact, a speck of dust in your room is larger by comparison.